Supplier of the Year Award presented to Gravity Pro Consulting at the 2013 WBEC-West Conference and Awards Gala. Our Excellence Awards highlight the dedicated and passionate women behind successful Women Business Enterprises. Gravity Pro Consulting, an SAP Gold-level Partner, today announced it was awarded the Supplier of the Year Award at the 2013 Women’s Business Enterprise Council – West 10th Annual Strategic Procurement Opportunity Conference and Awards Gala. 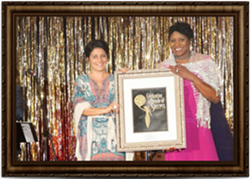 Sylvana Coche, owner and founder of Gravity Pro Consulting, accepted the honor at the WBEC-West’s awards gala in Pasadena, CA on September 20. Ms. Coche was recognized for distinguishing herself and her business by achieving continual growth, demonstrating superior customer service, consistently providing high quality products and services, and contributing to the advancement of woman in business. Ms. Coche founded Gravity Pro nearly seven years ago. Today, Gravity Pro is the leading women-owned Gold-level SAP value-added reseller. “WBEC is an amazing organization that does so much for the advancement of diversity in business. We sincerely appreciate this award and we are proud and honored to be recognized as Supplier of the Year. We feel that the breadth of our SAP resell capabilities combined with our business systems expertise and WBE status enables us to uniquely support our customers and open doors to expand new opportunities,” said Ms. Coche. To view the official WBEC Magazine Special issue covering the awards event, click here. Gravity Pro Consulting is an SAP Gold Partner and value-added reseller, specializing in helping organizations realize competitive advantages and organizational efficiencies through the power of SAP solutions. Gravity Pro has in-depth experience working with companies of all sizes and provides SAP software licensing, business process strategy, and full implementation services. This includes project management, project review and remediation, system upgrades and more. Gravity Pro holds the distinction of being North America’s leading SAP reseller certified by the Women’s Business Enterprise National Council (WBENC) and authorized to provide SAP solutions — including the newest cloud-based technologies Ariba™ and SuccessFactors™, SAP Mobile solutions, SAP HANA™ and SAP Business Objects. As a woman-owned company, Gravity Pro is certified for supplier diversity programs and can help companies meet goals for achieving strategic advantages with SAP solutions as well as support diversity spending objectives. SAP, SAP HANA and all SAP logos are trademarks or registered trademarks of SAP AG (NYSE: SAP) in Germany and in several other countries all over the world. All other product and service names mentioned are the trademarks of their respective companies.